[column width=”1/2″ padding=”24″] Whether you are looking to brush up on your artistic talents, meet some new friends, or simply have a relaxing evening of sipping on some local craft brews, Painting & Pints is your ticket to a fun-filled evening. Our evening begins as our GetKnit Gurus and the staff of The Paint Pub welcome you to their premier art studio and cafe. 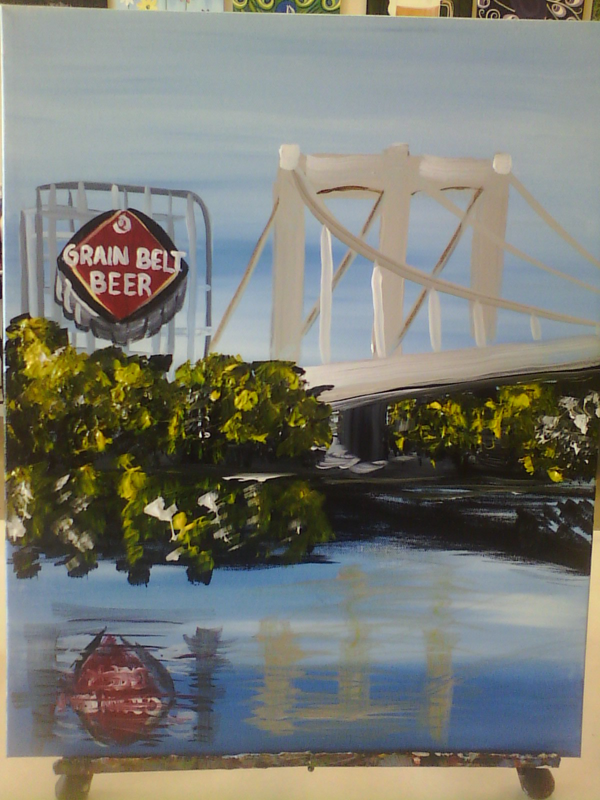 During a two hour long introductory painting class, a professional instructor will guide us step-by-step as we recreate an iconic Twin Cities scene – the Mississippi River and Hennepin Avenue Bridge. This event requires no previous painting experience, so whether you’re just beginning your artistic career or are the next Van Gogh, you will be able to create your own masterpiece that is sure to be a focal point in your home for years to come. Our creativity won’t be the only thing flowing during the event, as Badger Hill Brewing Company will provide us with several tastings of their finest beers while we unleash our inner Picasso.